Sometimes you just need a nice bowl of chili. January is the month for that! 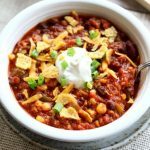 I know a lot of you are in blankets of snow and freezing temps so if you can make it to the grocery store pick up the ingredients for this instant pot turkey chili. Ground turkey: I used a lean(ish) ground turkey for my chili. You can also use ground beef. I just rarely have ground beef at my house so that’s why I opted for the turkey chili. Fire roasted salsa style tomatoes: I bought a can of these at Walmart and they provided a major flavor boost to the chili. If you can’t find them you can just use a can of fire roasted tomatoes instead. Corn: I chose to add a can of corn which gave the chili somewhat of a taco soup taste. You can leave the corn out if you prefer. Quinoa: To add some more texture and protein to my chili I added rinsed and uncooked quinoa. I love quinoa but you can totally leave it out if you want. If you do use it make sure to rinse well before adding it in to the pot. It will taste bitter if you don’t. Toppings: I love corn chips (Fritos) with my chili but you can also crunch up some tortilla chips (Juanitas are my favorite). 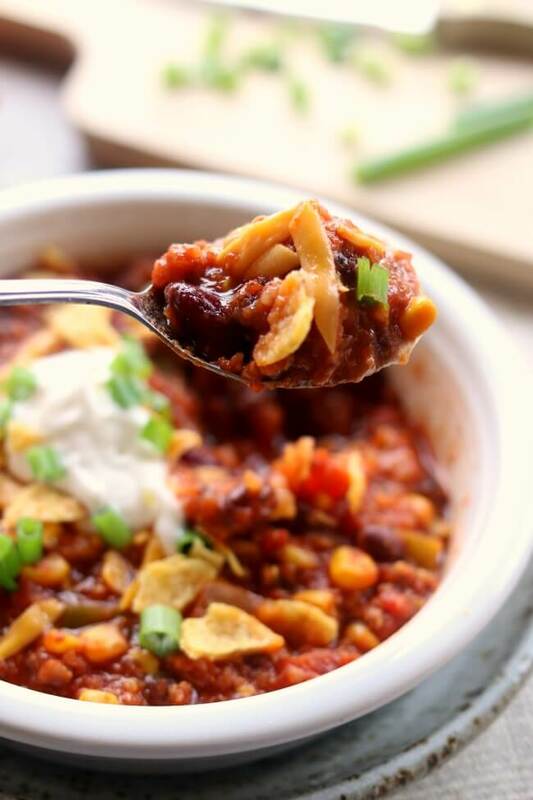 I do think that some kind of crunch on top of the instant pot turkey chili is necessary. 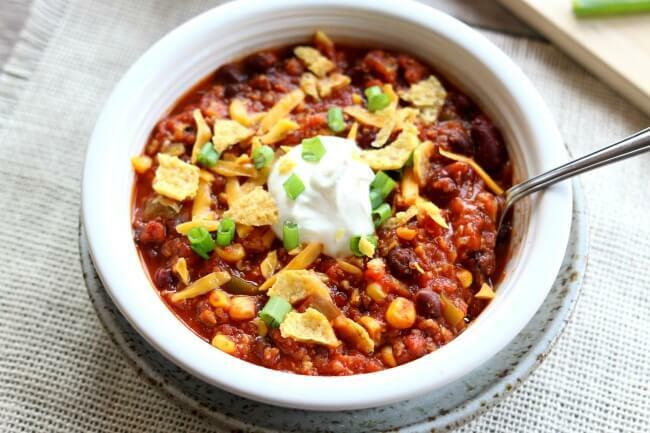 I also believe you need a dollop of sour cream and some grated cheddar to make the chili complete. 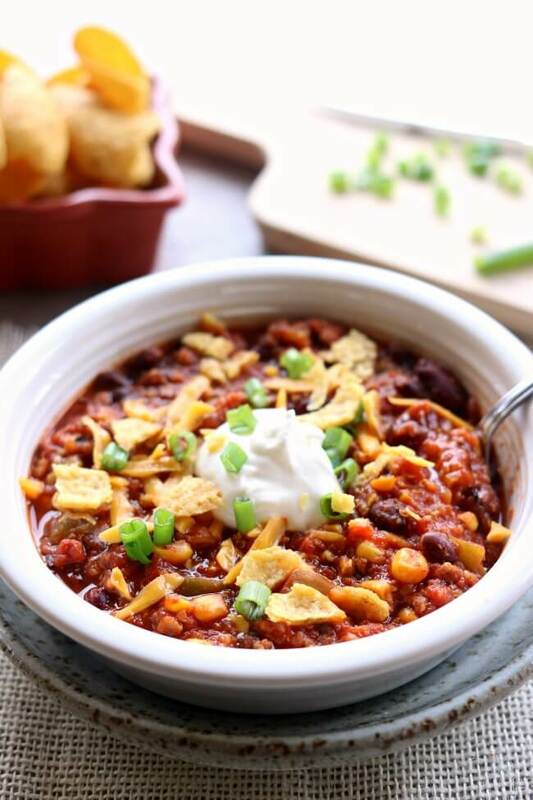 For Instant Pot Turkey Chili I used my 6 quart Instant Pot Duo 60 7 in 1*. I also own the 6 quart Instant Pot IP-LUX60 V3 Programmable Electric Pressure Cooker. * They are both great pressure cookers! The first one I mentioned has a yogurt making function but other than that they are fairly similar. The price difference between the two is about $20. Turn your instant pot to the saute setting. Add in the ground turkey and break it up with a wooden spoon. Brown it for a couple minutes and then add in the onions and garlic and saute until the onions are translucent. About 5 minutes. (If you’re using ground beef you may have to drain off grease). Add in the broth, green pepper, crushed tomatoes, fire roasted tomatoes, kidney beans, black beans, quinoa, corn, tomato paste, chili powder, cumin, salt, pepper and garlic powder. Cover and secure the lid. Make sure valve is set to “sealing.” Set the manual pressure cook button to 5 minutes on high pressure. When the timer beeps let the pressure release naturally for 10 minutes (or more, if you have time). Move the valve to venting and when you can, open the pot. Stir the chili and then season to taste. You may want to add in more chili powder, cumin, salt and pepper. Do you cut ingredients measurements in half if using a 3 qt instant pot? If the recipe is too big then yes you would. Just make sure the ingredients don’t go over the max fill line. Hi! Made this tonight. Tasted great! Giving it five stars because the flavor was awesome. Only thing is we love spicy food and it wasn’t very spicy at all :(. What should I add to give it more kick? Maybe some red pepper flakes? This recipe is perfect by itself – or a foundation to add your own touches. 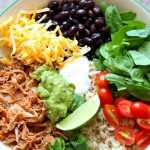 We threw in a small can of chipotle peppers with adobo and it added an earthy element. Thank you! Awesome to have chili in the instapot. Great flavor! It tasted as if it had been simmering in the spices for hours & hours. I nixed the quinoa and corn. I prefer my chili a little chunkier but next time I’ll just use less broth. Still had great flavor!!! Hi how long should I cook if I use chicken and double the recipe? 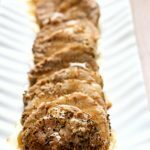 ground chicken or chicken breasts? I don’t have a green pepper, do you think adding a little bit of wheat grass powder will give the earthy taste of the pepper? I have to give this recipe 5 stars because the flavor is amazing, it really tastes so good! However, EVERYTIME I cook this recipe in my IP I get the burn notice. One night I got the burn notice 3 times in a row! I’m not sure why this keeps happening with the recipe but it’s so frustrating. Maybe next time I’ll try not stirring and just layer everything? My instinct is to always stir the food up before cooking so all the flavors get mixed up but maybe that’s my problem 🤷🏼‍♀️. Anyways, the recipe is good enough for me to keep trying to cook it and figure out what I’m doing wrong! Dang it. I would try not stirring. Sometimes when tomato products are touching the bottom the burn notice comes on. Do you have a duo? lux? No, I just have a regular 6 qt IP. I’m going to try cooking it again this week and not stir it to see if that fixes the problem! This burn notice happened to me too. 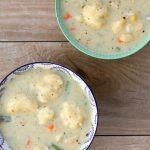 My family loved this recipe and I love how easy it was! 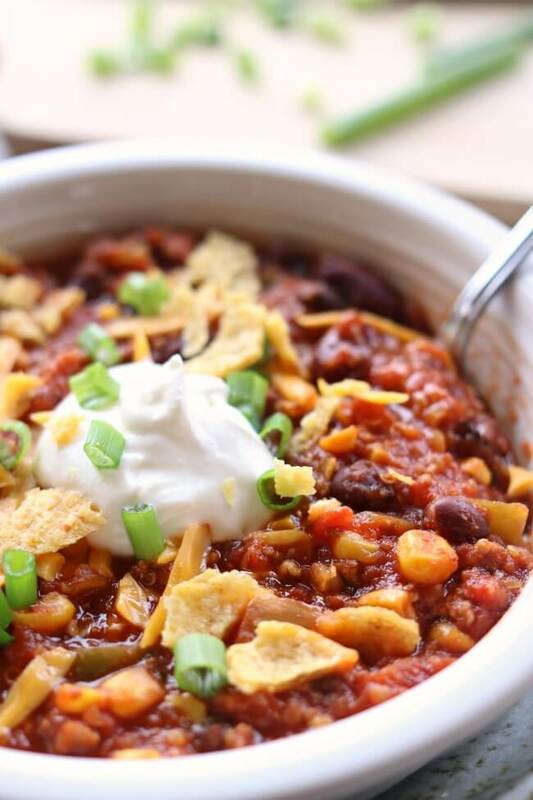 For my husband and my bowls, we added some Sriracha powder/spice… definitely added some heat but gave the chili much more flavor and made it even better! I made this tonight…followed the recipe all except green peppers. It was DELICIOUS and so quick and easy. Thanks! Hi Flo, thanks so much for your comment. I love this one too! Nice balance of flavors and textures. I added Mexican oregano. Instead of regular yellow corn, I used posole, which are large whole “hominy” corn kernels. They add even more corn flavor and have a nice toothsome texture. So if you can find canned posole, or whole-kernel hominy, in your supermarket, you should try it. I like your suggestions! I will have to try this for sure. I think you could keep everything the same for the 8 quart. I dont understand #3. If its on Saute and then I turn the lid , I cant make the timing button go up or down. Should it be on stew? Ive tried every thing. It just flashed 30 minutes and then it says on. Im just staring at it. …. ok now its says 30 min and I still cant get the manuel timer button to work. I’m sorry Dena, did you figure it out. Turn off the saute button before you put the lid on. Then put the lid on and press the manual button. I got the “Burn” message, ugh! I stirred the food up before turning it on. Should I not have stirred it first? Hmmm, weird. Next time try not stirring first and make sure to deglaze the pot after sauteeing the onions and garlic. 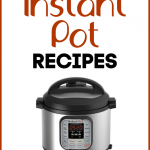 Welcome to the instant pot! you will love it. I’m so glad you tried my recipe first!! 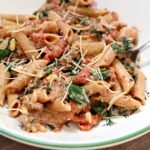 This was my first Instant Pot recipe as well. It was absolutely delicious and I look forward to making many more. I never leave reviews but this was so good I had to. 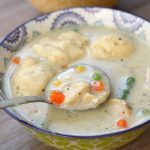 This was my first instant pot recipe to try. I love this. Easy and great taste. Welcome to the IP world! Glad you liked it. It tastes good, but it has a kind of mush consistency. We may have cooked it too long because we had a mishap with our IP counting down before coming to pressure. Hmmm. Weird. It shouldn’t be mushy. Hope you can figure out your IP!